Steven Land shirts will let your Windsor knot show more prominently then wearing a spread collar cotton dress shirt and if your spread collar dress shirt has french cuffs, that is even better. 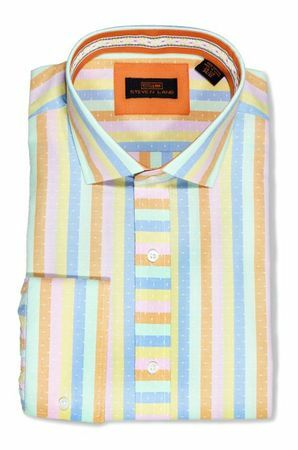 This pastel color multi stripe french cuff shirt by Steven Land comes with the head turning style ready to make you look like an instant Celebrity. The fabric of the shirt has a multi color stripe pattern that is quite classy looking and the french cuffs simply finish that look. Made of 100% fine Cotton.